I try to keep this blog fairly light. Sometimes, however, I need to write about things that are not pleasant, but which are on my mind. This blog is, among other things, my form of prayer, as I recently discussed here. As Malcolm Boyd in his original edition of Are You Running with Me Jesus? talked to God is a casual, personal, and conversational style, so here I am often talking to God in a casual, conversational manner just as much as I am sharing with you, Good Reader. Yesterday I read in the newspaper that the state of Ohio changed their drug mix for executions on account of a botched execution last year. You are no doubt painfully aware of the execution yesterday in Oklahoma that went terribly wrong. The issue of the death penalty has been on my mind for years, and it is very much past time that I wrote about it. As a society, we do not want to take responsibility for executions. Just as Pontius Pilate is portrayed in the Matthew account, we want to wash our hands of the act and not own it. The electric chair replaced hanging because it was thought to be more humane. The gas chamber replaced the electric chair for the same reason. And the same logic applied when lethal injection replaced the gas chamber. But how many terribly, seriously, horrendously botched lethal injection executions have we seen? If you believe in the death penalty, which I don’t, what is wrong with the firing squad? Simple. Effective. Quick. Final. But that means someone is actually killing someone. Someone is picking up a gun and pulling a trigger. We can’t have that. We want to distance ourselves from the act. Which is where the tradition came from that one of the shooters always had a blank in his rifle. That way each shooter could believe that he was the one with the blank and not responsible for the convict’s death. The fact that we have to go through such convolutions suggests to me that maybe the death penalty is just a really, really bad idea. Are you there God? It’s me, Mike. You get her point. I found myself caught up in the very same error. 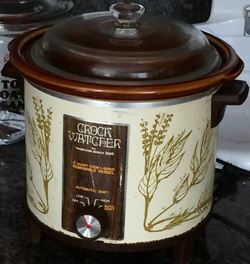 Trader Joe’s in their Fearless Flyer promoted their brined whole chicken and suggested it was a good crock pot candidate. That made a lot of sense to me. I found a whole chicken crock pot recipe, which called for a spice rub. It turned out OK, and the broth was great, but the chicken itself was a tad bland. The recipe didn’t say anything about making sure you got the rub underneath the skin, so I didn’t. But I should have. I knew that. (As the Michael J. Fox Alex Keaton character used to say on Family Ties.) In fact, I know that well from our Thanksgiving turkeys. Duh. The next time, I got the spice rub (mine – not the one in the recipe) well underneath the skin and it was marvelous. Terry loved it. She raved about it. That dish has now become one of her favorites. I rarely follow a recipe exactly. I think I was so careful in this instance because a crock pot whole chicken was something that I had never done before. The fact that the recipe called for no liquid whatsoever made me a tad nervous. But still, really, I do know better. My blog entry for Easter Monday was rather grim. I wanted, therefore, today to share some of the joy of Easter. I can’t thing of anything original to say that would express it better than Margaret did over at leave it lay where Jesus flang it. In her blog entry new way of being she writes that Easter is longer than Lent. I hadn’t thought about it, but it’s true. I like that a lot. Lent is 40 days, which doesn’t include Sundays. It’s 46 actual days from Ash Wednesday to Easter. Easter is 50 days. How very cool is that? …the really good news is this: The sure sign that God is good is that Easter is longer than Lent! Easter is not just a day –it is a season –fifty days long… a season when we have the opportunity to practice living the Resurrection –living the new life –and liturgically we practice that by not confessing our sin –by not reading from the Law and Prophets, looking back to our roots, but reading only from the Christian scriptures, our spiritual ancestors, putting us in mind of our own calling of the eternal priesthood of Christ. This book covers the same material as the PBS television series, but it is no mere TV tie-in. It is a substantial standalone volume in its own right. In addition to the text, there are maps, notes, references, and pictures. Schama covers a lot of territory in the book. He opens it describing the Jewish military outpost at the garrison of Elephantine in ancient Egypt. He ends describing the plight of the Jews in Spain in 1492. The book is not linear. He moves from one time period and locale to another, and often jumps to the nineteenth century or the present day to describe the work of archaeologists and scholars. Schama’s writing is engaging. The prose is more lively than that of most nonfiction books I’ve read recently, and he includes a good share of wit. Schama is a skeptic, not a believer. He is careful to talk about what we can actually know versus what we what we must surmise or deduce. I enjoyed the first half of the book more than the second half, but that’s just me: I am more interested in antiquity than modern history. This is a highly readable book for anyone interested in this slice of world history. I wrote a while back about how I wasn’t training for a 5k. I am now. Terry and I have both registered for the Mushroom Mardi Gras Fun Run on May 24. 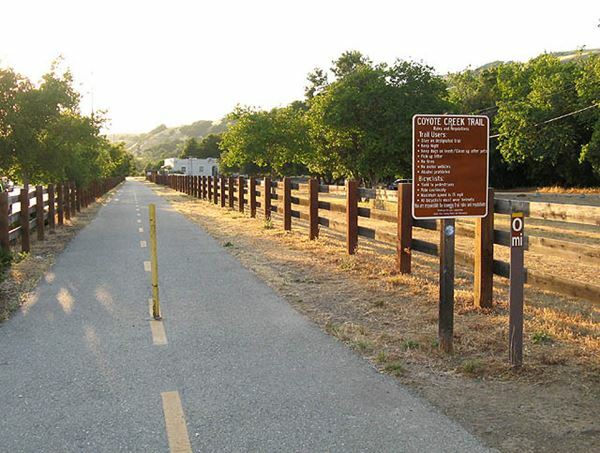 We’ve done it before and it’s a very enjoyable semi-rural course along the southern end of Coyote Creek trail. It’s always good to have a goal to head towards.